Beautifully engraved uncancelled certificate from the Canadian Pacific Limited issued in 2000. This historic document was printed by the Canadian Banknote Company and has an ornate border around it with a vignette of the Greek God Hermes running around the earth. This item has the printed signatures of the Company’s Chairman, President and Chief Executive Officer, David P. O'Brian and its Corporate Secretary. Canadian Pacific Limited was created in 1971 to own properties formerly owned by Canadian Pacific Railway, a transportation and mining giant in Canada. 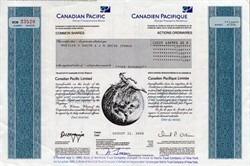 In October 2001, CP decided to spin-off the remaining businesses it had not recently sold off, thus creating separate companies for each, including Canadian Pacific Railway Limited.